How to delete my Facebook account permanently on iPhone Android mobile phone app immediately without password? Guide to delete Facebook link. If you have had enough of Facebook, here’s how to delete Facebook account permanently on PC or via Facebook App on mobile phone. Facebook is a great place for people to get around. But it can also be the place where your privacy can be taken advantage if you have a lot of photos uploaded, personal info entered, etc which everyone can access if you are not careful with your account. Whether you are afraid of your privacy, getting harassed, or simply have had enough of Facebook and want to get rid of it, you should first consider to deactivate your Facebook account instead of deleting it. Deactivating Facebook account will temporary remove your profile page and everything you have uploaded until you decide to come back and reactivate it. This way your profile page, photos, videos and posts will still be stored in Facebook server but will not be accessible by anyone until you decide to reactivate it. Guide: how to deactivate Facebook account link. 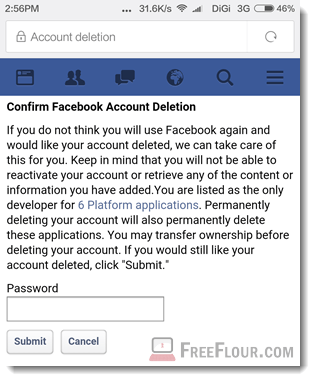 If you have decided to ultimately delete your Facebook account permanently, which means your profile page and everything you have posted and uploaded will be permanently removed and can no longer be restored anymore once you have deleted your Facebook account, move on to the step-by-step instructions below to delete your Facebook account permanently. To delete your Facebook account, go to https://www.facebook.com/help/delete_account. The deletion process may take up to 90 days for Facebook to fully delete your info and data you’ve posted to them, such as your status updates, photos and videos. It doesn’t really matter because since the second you have submitted your Facebook account deletion request, your info will no longer be accessible to anyone using Facebook. However, some linked actions such as messages and chat conversation between you and your friends or groups of friends will remain even after you’ve deleted your account. If you seriously need them to be removed, you will have to personally contact your friends and ask them to remove the conversations. If you want to delete your Facebook account directly from your mobile phone (iPhone or Android), you will have to use a browser on your smartphone and follow the steps above. They are all the same. Please be warned that this is about deleting your Facebook account, not the Facebook App. 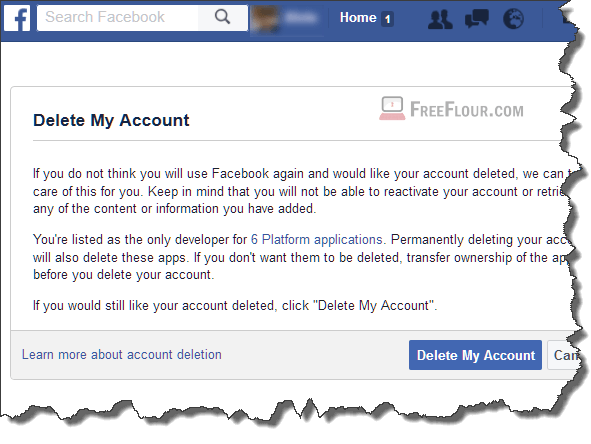 Make no mistake as deleting Facebook account would mean a permanent removal of your existence from Facebook entirely. If you are looking to just remove the Facebook App from your mobile phone, go to Setting > Installed Apps > look for Facebook and press Uninstall. For iOS users, simply tap and hold on the Facebook App until it shakes itself, then click on the cross sign above it to uninstall it.